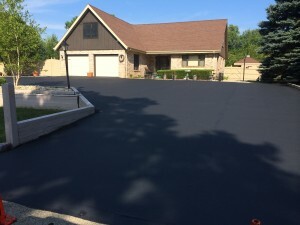 Armored Sealcoating is just one call away for asphalt driveway and parking lot maintenance in Oak Creek, Wisconsin. Our professional asphalt contractors provide high quality seal coating services with efficiency and respectfulness. We service both residential and commercial asphalt driveways and parking areas. We also provide snow plowing services in the winter! Contact us for a free asphalt seal coating or snow plowing estimate today. Professional asphalt seal coating can help prevent and/or delay the corrosion of your pavement. This means your asphalt will last longer and look better all around. Less quality asphalt maintenance jobs will last typically 1-2 years tops. With Armored Sealcoating, you can count on 3-5 years before a resealing is necessary! Obviously harsh weather and higher traffic volumes can have an impact on this and potentially shorten the time, but we firmly stand behind our work being quality and lasting the longest. Cracks in your asphalt are just the start of some very serious problems (and aren’t visually appealing). Crack filling is an important part of asphalt maintenance to keep your asphalt strong and lasting the longest without deep corrosion. Asphalt cracks that are untreated can spiderweb and spread or deepen beyond an easy repair. The worse the crack, the higher the threat of water breaching the base of your pavement and deteriorating to the point of needing full replacement. Armored Sealcoating provides convenient crack filling and crack repair services even in between seal coating jobs! Armored Sealcoating is an incredible choice for asphalt patching and pothole repair in Oak Creek and South Milwaukee. We have the experience and resources to properly repair pavement damage of many calibers. It’s important to note that severely damaged asphalt can not always be patched, it may require more extensive services. We’ll evaluate the extent of damage and recommend asphalt services based on your pavement needs and budget. Wisconsin is known for its ever-changing seasons. Armored Sealcoating provides services year-round. In the winger we make your snow days less stressful, and less demanding of you by offering efficient snow removal services. Our snow plowing services include both residential and commercial snow removal. We will clear snow from driveways, parking lots, and walkways throughout Kenosha and surrounding areas. Armored has firewood for sale near Oak Creek, Wisconsin. Give us a call at 262-515-4150 to learn more about pricing and pick-up. Our firewood options include hardwood and oak, or you can choose a mix of both. Whether the heat in your house runs on firewood or you simply love campfires, we have a quality stock of wood waiting for you. Have a home or business in Oak Creek in need of seal coating services? Give us a Call at 262-515-4150 or contact us online today!